Winter was long, spring seemed too short and now summer is in full swing. 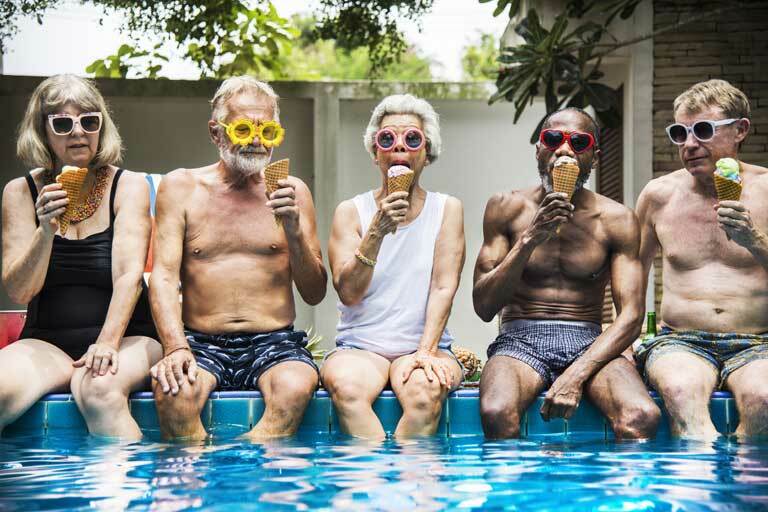 When the hustle and bustle of summer activities leaves you feeling like you don’t have time to focus on much else, take time to remember these 10 simple yet effective tips to ensure you have a healthy summer. In 2012 alone, more than 3.3 million people in the U.S. were treated for nonmelanoma skin cancer. Of those 3.3 million cases, about 90 percent were associated with exposure to ultraviolet radiation. Sounds scary? Thankfully, there’s a quick and easy way to reduce your risk by up to 40 percent. Daily usage of an SPF 30 or higher sunscreen lotion can dramatically reduce the amount of UV radiation your skin absorbs. If you plan on being out in the sun for an extended period of time, reapplying sunscreen every two to three hours will allow the preventative effects to continue working. Water is always important to remember, but especially when temperatures begin to climb. The U.S. National Research Council recommends drinking eight to 10 8-ounce glasses of water each day. You can also calculate exactly how much your body will need by dividing your body weight (using pounds) in half and drinking that many ounces of water. Most importantly, listen to your body. Summer heat takes its toll on your body, so you are your most important indicator of when to drink more. Symptoms such as headache, cramps, fatigue and lightheadedness can all be signs of dehydration. Even an experienced swimmer might need help. Swimming is an excellent way to cool down in the summer heat and get in some exercise time, but the dangers that come with it are worth noting. Never allow small children to swim unattended, and use life jackets for children and other non-swimmers. Be sure to never dive into water without first knowing the depth, and avoid consuming alcohol before or during swimming and while supervising children. Put a stop to pests. Mosquitoes and ticks are most active during the summer months, and both insects carry potentially harmful diseases. Protect yourself from these diseases, such as West Nile virus and Lyme disease, by using a bug spray with DEET and avoiding places where ticks and mosquitoes are commonly found, such as heavily wooded areas and swampy wetlands. If you have pets that are frequently outside, using a flea and tick-preventing medicine can also help keep ticks from being brought into your household and can help keep your pet disease-free, too. Take advantage of summer harvests. Summer is an excellent time to try out fresh fruits and vegetables from local growers. Adding these locally sourced products into your diet will not only help you feel better about yourself, but will add essential vitamins and minerals into your diet that will help keep your body in top shape during the summer months. Try out new combinations of fruits in smoothies, and cook up something delicious with fresh veggies to add these key ingredients to your healthy summer. Go outside earlier in the day. Summer brings about longer days, and the weather is typically milder earlier in the morning. Beginning your day with a short walk or jog outside can help keep you physically in shape, and can help jumpstart your brain to give you that needed boost to make it through the day. Enjoying the earlier mornings will also help you fall asleep quicker at night so you can start the cycle all over again the next day. Let’s face it: we love our hair. It’s something that makes us unique and can make us feel good about the way we look. Keeping your hair healthy during the summer is especially important. Constant heat, sun exposure and swimming pool chlorine can leave your hair feeling dry, brittle and dull. During summer months, try to minimize the usage of hair dryers, straighteners and other products that apply heat to your hair. For those who swim a lot, consider using an anti-chlorine shampoo and conditioner to help protect your hair and keep it looking its best. Prolonged exposure to UV rays can really take a toll on one of your most important bodily functions – your eyesight. Use sunglasses that block out at least 99 percent of ultraviolet A and B rays to help prevent cataracts and even stop wrinkles from forming under the eyes. Worried about style? Don’t; you can still find some stylish shades that offer substantial protection from the sun. Summer fun never looked so good. Be smart about your vacation. Summer vacations are something many of us look forward to. Whether it’s the beach, the mountains or a summer cruise, vacations are a time to unwind, relax and reconnect with yourself and others around you. Always remember to vacation wisely to protect yourself and minimize stress. Be sure to let someone back home know where you’re going, how long you’ll be gone and how often you plan to check in. Ensure your home is properly locked up, and when possible, unplug appliances such as coffee makers and toasters to cut down on fire risks while you’re away. If your summer vacation involves a camping trip, make sure to properly store food and drinks to reduce the risk of foodborne illness for you and those around you. Increased summer temperatures can put extra strain on your heart, so be sure to protect one of your most important organs. Wear lightweight and breathable clothing to keep your internal temperature stable, and avoid strenuous exercise between noon and 3 p.m., when the sun is at its strongest. This will help prevent unnecessary strain on your heart and keep it functioning at its best. Following these tips can help ensure you have the most enjoyable summer while staying safe and healthy. Always be sure to consult your health care provider before beginning any new exercise or diet routine, and make sure you listen to your body to determine what’s right for you. Now go out, drink some water, apply sunscreen and hit the beach!